PMC Twenty 22 review | What Hi-Fi? It's fair to say PMC has been one of the big hi-fi success stories over the past couple of decades. The company started in the professional world – the initials PMC stand for Professional Monitor Company – but pretty soon it moved into the domestic market too. The new Twenty series celebrates the company's first 20 years, and builds on everything it has learned over that time. 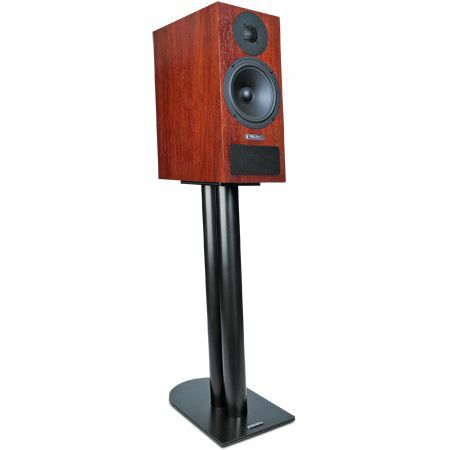 The speaker on test here, the 22, is the larger of the two standmounters in the range, and it looks every inch a hybrid of PMC's long-running 'i' series and more recent Fact designs. Technically the Twenty range is all new, though: as with their appearance, sonically the speakers build on what has gone before. The tweeter, a 27mm Sonolex dome, is designed to deliver high levels of detail with a wide dispersion. The mid/bass driver uses a doped-paper cone – PMC likes paper's light weight, rigidity and resonance behaviour – and is specifically designed for use with a transmission line design. It's the inclusion of a transmission line that makes PMC speakers different from most. The idea is that the rearward output of the mid/bass driver is forced through an internal folded path that exits through the rectangular grille at the front of the speakers. This path is lined with specially chosen damping material that absorbs all but the lowest frequencies in the sound. As these very low frequencies exit the transmission line, they augment the forward output of the driver. PMC thinks this is the best way to get high quality, low-distortion bass. Other technical highlights are the slight rearward slope on the enclosure's front and rear panels. These not only give the speakers a distinctive look, but also help cabinet rigidity and reduce internal standing waves. There's plenty of attention to detail, with high-quality binding posts, smart badges and good-quality veneer. The 22s may have a premium price tag, but physically they live up to any high-value expectations. And, happily, so does the sound quality they produce. These monitors' sonic signature mirrors that of the high-end Fact series. The Twenty standmounters are immensely fast and precise. Their detail levels are excellent, and they deliver the sound with breathtaking agility. You can add wide dispersion and an impressively expansive yet focused soundstage to the list of plus points. Tonally, the speakers sound a little lean and immensely taut. Some may prefer a more relaxing presentation, but it would be very hard to find such leading edge definition and speed any other way. The 22 may be medium-sized standmounters – standing 41cm high – but the bass weight and power they produce is impressive. This low frequency performance is agile enough to integrate well with the explicit midrange and leads to a really cohesive overall performance. These PMC speakers do it all. They have the scale and power to do justice to Tchaikovsky's 1812 Overture in full flow and the tonal balance to render individual instruments convincingly. They'll also deliver intimate music such as Bon Iver's Michicant with a pleasing amount of finesse. Their detail resolution and way with low level dynamics is as good as anything we've heard at this price level. Overall, these 22s are excellent speakers for the money. PMC has put 20 years of experience to good use.